We got this goofy-looking eggplant in our CSA box yesterday. It's got a nose on it, kinda looks like Jughead from the Archie comics...only dark purple, of course. So I shared a picture of Cathy modeling it. Hey, it's summer, it's silly season, and I'm trying to crank out three stories before I leave for a trip to visit A-B's maltings in Idaho Falls and some barley farmers. I just finished one of the stories, and I'm taking a break. Think of it as a promise of better stuff to come. 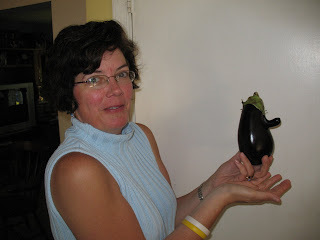 That's an extremely rare Nixon eggplant. Smithsonian? I'm thinking National Enquirer; more money. I think she was holding it upside down. Yeah, Dan, I did too...but Cathy wouldn't let me put that picture up.